My name is Edwyn Alawydd Cassidy and I’m a student in Year 10 (going on to Year 11 now) in Ysgol Uwchradd Bodedern. I live in Bryn Du near Llanfaelog and Rhosneigr, and study Geography and Religious Studies in school as Bodedern do not offer a Politics course. 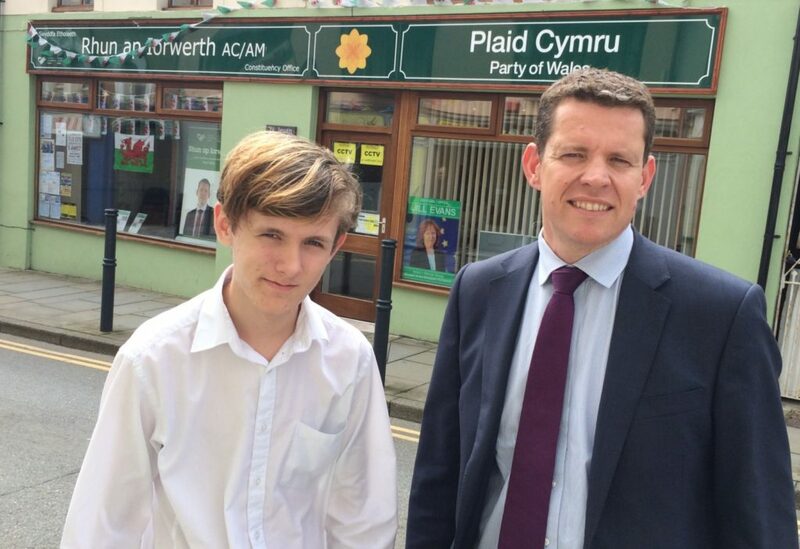 When I had to choose somewhere to do work experience by the school, I chose Plaid Cymru, in Rhun ap Iorwerth’s office which is in Llangefni. I was very supportive of Rhun ap Iorwerth and Plaid’s work in general, and had supported their work in the Assembly. So, as I had a great interest in politics and wanted to learn more about it and how it worked, this is where I went. To be honest, the week I did my work experience was a very quiet week as it was during a break in the Welsh Assembly. However, there was still much to do in Llangefni. For the first four days I stayed in the office in Llangefni and met the workers, read the news, and kept the staff up to date with any important news. I also had to type up a few eMails, accompany Rhun in his meetings and make tea for the workers (though this last one wasn’t entirely necessary). Later on in the week I started making phone calls on Plaid’s behalf, helping out with the Cangen Plaid Cymru Ifanc that would be advertised at Sioe Môn and I wrote some papers and briefs about a range of topics. On the last day I went with Rhun ap Iorwerth and Non ap Gwyn to Llangoed in the morning so that we could have a meeting with some people there who couldn’t have access to Superfast broadband or BT. For about an hour we stayed there listening to the community tell their story and I would make occasional notes in my book. Eventually we took a few photos for the newspapers and left. For the rest of the day I quickly finished up with what would be needed for Sioe Môn and wrote this blog, along with the photo that was taken of me and Rhun in it. To conclude, this was definitely a fun week and I will definitely miss working here. I was able to learn a lot about politics and the inside of the Welsh Assembly, and will definitely make use of what I learned later if I pursue a career in the political field.